As a full-service metal shop in Anaheim, California, with more than 80 years of experience, Bob's Welding, Machining & Fabrication excels at the design, fabrication, and customization of metal carts, racks, trailers, and material handling equipment. We can sheer, plasma cut, form, machine, and weld nearly anything out of aluminum or steel, and have thousands of satisfied clients throughout Anaheim, Orange, Fullerton, Tustin, Brea, Westminster, Santa Ana, Yorba Linda, and surrounding cities. Whether you have detailed plans or just a general concept, call us today. We offer free consultations, competitive rates, and fast turnaround times. Bob's Welding fabricated this custom cart frame for a local aerospace company. 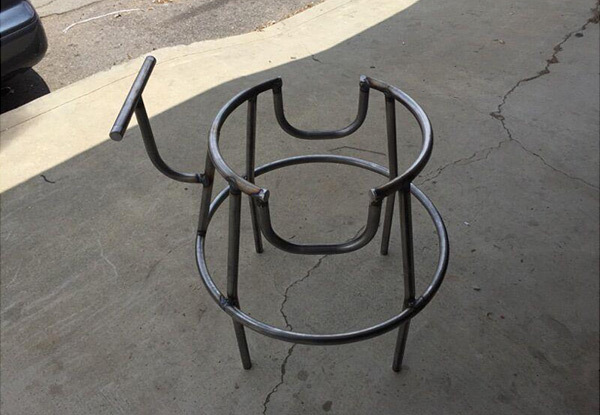 We bent, rolled, and welded steel tubes together to create a cart frame that met the customer's specifications. Our client needed a trailer ramp fabricated for his race car. We used our customer's specs to create an aluminum ramp that was both lightweight and heavy duty. 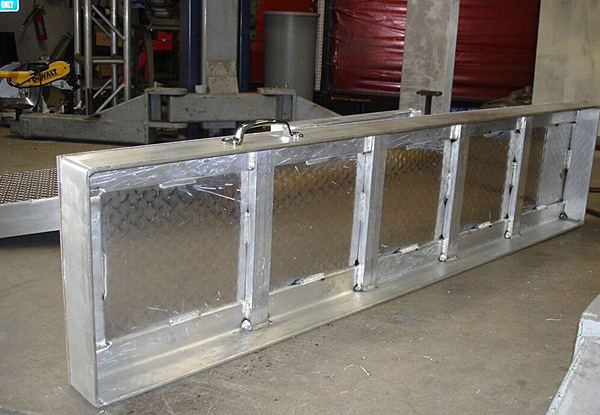 We fabricated this custom aluminum sound cart for a sound technician in Orange County. 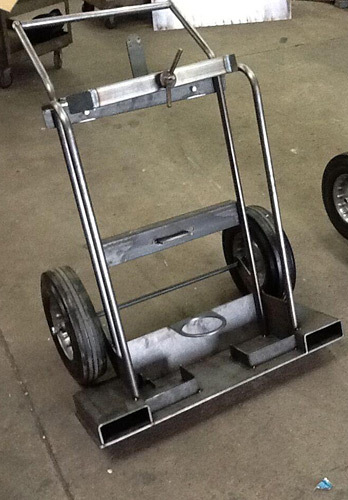 We worked with our client's sketch to create a cart that was lightweight and would accommodate his equipment needs. 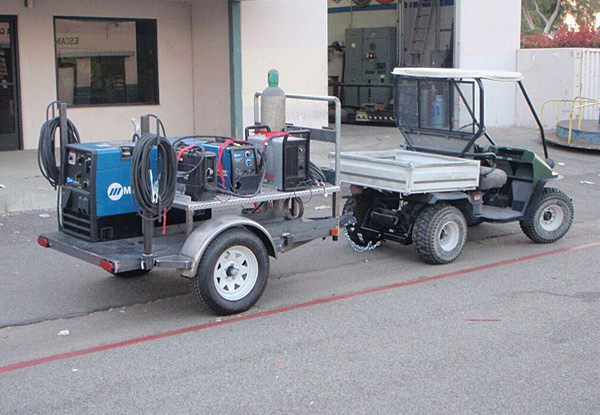 Bob's Welding designed and fabricated this custom steel equipment trailer for an Orange County client. We designed the trailer taking into consideration space needs, intended utilization, weight balance, and the customer's wishes. 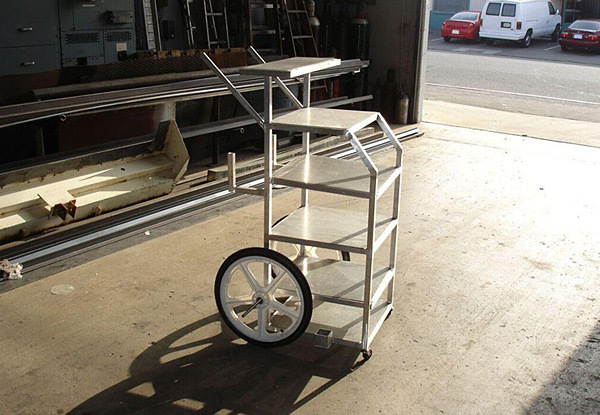 We designed and fabricated this custom equipment cart for a client in Anaheim, CA. Our client needed a cart that could hold a tank and other equipment. 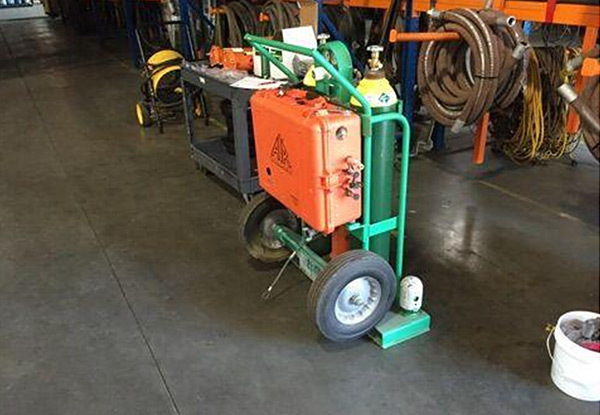 We created this equipment cart using steel tubing with a powder coat finish for a functional and clean look. 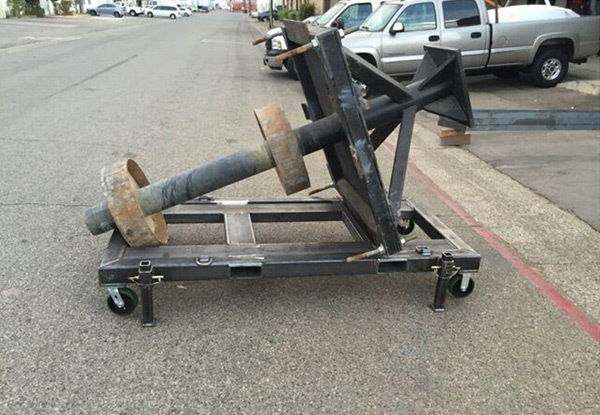 This heavy duty steel transportation dolly was fabricated by Bob's Welding for a Southern California Amusement Park. The park needed a heavy duty dolly that could store and transport a large prop. We designed and fabricated the dolly using the customer's specs and input. This picture shows our custom tank cart finished and in use by our satisfied customer. Before painting the steel cart we tested the cart to make sure it was user-friendly, all equipment fit properly, and all clearances were correct. We work with our clients to make sure we are creating exactly what you're looking for. 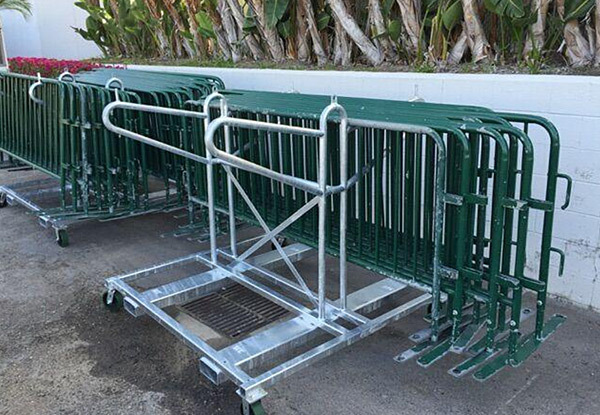 We designed and fabricated these portable barricade storage carts for the Anaheim Convention Center. They needed storage carts that would enable them to transport and store multiple barricades. The project involved cutting, bending, welding, and hot dip galvanizing steel, and then attaching the wheel assembly. Our client in Anaheim, CA needed a custom metal cart that would enable them to transport multiple chairs from room to room. The cart needed to be sturdy, withstand a lot of wear and tear, and be easy to use. We designed a prototype, tested it, and made revisions before fabricating and powder-coating the final product seen here. Our client was thrilled with the product and has become a repeat customer. Our client brought us this trash cart that was being used to haul thousands of bags of trash on a daily basis. They requested a redesign on a cart that would be heavy duty and could take excessive wear and tear, as well as have the capability to be connected to other carts and be pulled by a golf cart. For the redesign and refurbishment we used steel, stainless steel, expanded metal, UHMW bearings, and low maintenance foam filled tires. The metal makes the cart more lightweight and the stainless steel pan contains liquid from leaking trash. The finished product includes locking sides to hold bags in and prevent them from falling over. 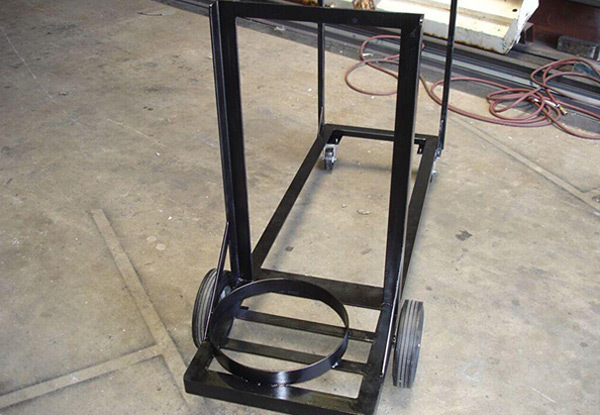 Our client was in need of a custom cart that could be used for an industrial painting application. The cart needed to fit two tanks as well as support a ventilation system. It needed to be sturdy enough to hold all the equipment and light enough to be wheeled around by an individual. We designed the cart with the ability to be forklifted as well as transported back and forth on a work truck. Bob's Welding created this custom personal show car trailer using steel and aluminum. Our client wanted a custom trailer that was both functional and show-stopping. 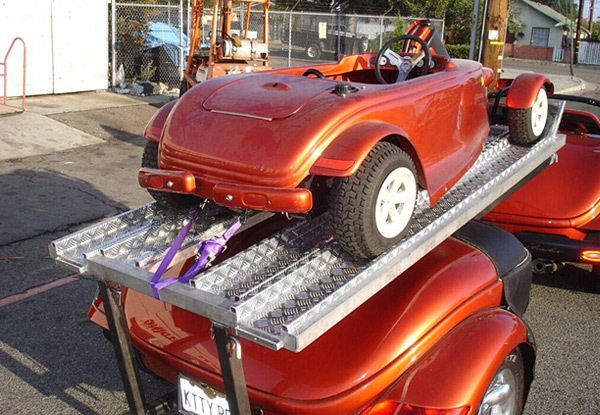 We used the customer's specs to design and build this trailer so he could easily haul his mini car. I wanted to have my tent trailer modified so that the tongue could be removed, allowing it to fit completed with my garage (with the door closed). Bryan (the owner) reviewed my conceptual sketches and agreed to take on the project. During the course of design and fabrication, Bryan was accommodating of minor changes and also improved several aspects of the design . . .